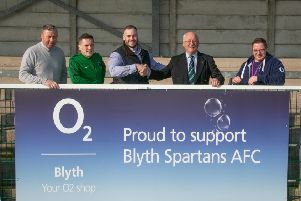 Blyth Spartans finished their league season on 99 points after a home defeat at the hands of Marine preventing them breaking the 100 mark. Spartans, fielded a side with several players rested in advance of Tuesday night’s play-off semi-final against Workington at Croft Park. The Merseysiders almost snatched the lead within the first minute but Andy Owens dragged his shot wide. Blyth responded when a Paul Robinson cross eluded the on-rushing Wilson Kneeshaw and fell to Robbie Dale, but his shot was parried away by Matty Cooper in the Marine goal. The home side went close again on six minutes when, following excellent play between Alex Nicholson and Daniel Maguire, Dale found himself free eight yards out but his first time shot hit the post. Marine’s Chad Whyte hit an effort over the Blyth bar before lose play in the home defence gave Owens the opportunity of scoring but he fired narrowly wide. Blyth Spartans midfielder Paul Robinson in action against Marine on Saturday. Blyth took the lead on 37 minutes when Robinson showed great skill in twisting and turning before unleashing a precise shot from eight yards which beat Cooper at his near post. Only two minutes later Nicholson almost extended Blyth’s lead. Dale found Jordan Watson whose cross was hit into the ground by Nicholson, enabling Copper to stretch and push his shot over the bar. On the stroke of half-time a Nicholson cross found Kneeshaw in the box but he side-footed the ball well over Cooper’s bar. Blyth lost their dominancy in the second half and the visitors got off to a dream start. On 50 minutes Warren Bellew crashed a spectacular shot past Otte from the edge of the penalty area. Three minutes later Otte did well to push away another tremendous long range effort, this time from Owens. Spartans hit back with Dale sending a superb 40-yard pass to Watson wide on Blyth’s left. His cross found Kneeshaw but the striker’s shot was well blocked. Maguire then fired wide when he looked likely to score. The ever- dangerous Owens shot just wide of Otte’s post before Robinson for Spartans tried his hand from 25 yards, but Cooper collected the ball comfortably above his head. In a match littered with shots from distance, it was appropriate that the winning goal should have been of that ilk. With eight minutes remaining substitute Danny Mitchley sent a raking shot past Otte from 25 yards. Mitchley almost added to his tally when he shot just over the bar. In the dying minutes a Michael Richardson shot failed to trouble Copper and the Marine keeper then secured the victory with an athletic diving save from a Dale header. Depending on the result of Tuesday night’s play-off semi-final will determine whether Spartans will contest the play-off final at Croft Park on Saturday with a 3pm kick-off, or whether their season will be over. Blyth Spartans: F Otte, A Nicholson (A Cartwright 85), J Watson, D Parker, D Morse, P Robinson, M Richardson, N Hooks, D Maguire, W Kneeshaw, R Dale. Subs not used: M Wade, D Mullen, S Reid, N Buddle.